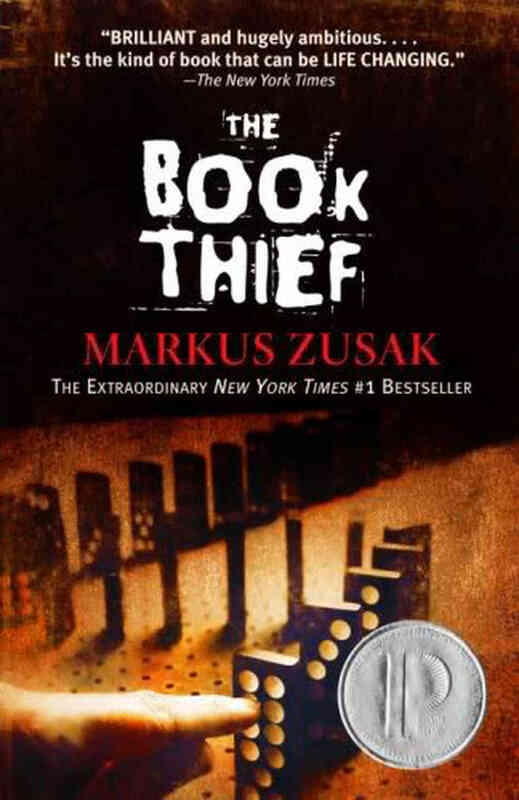 The Book Thief, by Markus Zusak, is the story of Liesel Meminger, a blonde girl with dark brown eyes, living with a foster family in Germany during World War II. But the most interesting thing is the narrator of the story: Death. A long time ago my grandmother was reading this book and insisted I read it. At the time I was busy with other things and found excuses not to do so. Then last December I saw the title again and decided to give it a try. But I read about a third of it and had to return the book to the library. At the end of January I got the book again and devoured the last two-thirds of it. When I was done reading the last page I felt this emptiness inside of me. Do you know what I mean? It was as if I had been in a cave and had suddenly emerged from it. My eyes took their time getting used to the light of day once again. That’s how I felt. I held the book in my hands and just said the last line of the book in my head. I loved it! And that made me really, really sad. You see, I love libraries. Love them! I love going to the library and just touching the books on the shelves. I love the ability of reading anything I want without having to worry about money. To be honest, if I could, I’d buy all the books I want to read. But unfortunately I don’t make that much money. And that’s why libraries are so amazing, because they are for everyone, regardless of how much money they make. But every now and then, when I read a book I truly enjoy, I get sad because I know I have to return the book. It’s not my book to keep. Is this silly? Maybe it is. But it’s okay. At least I have one more book to add to my ever-growing list of books to buy even though I’ve already read them. If you have a chance, read it. It truly is an unforgettable story. Do you like books? Of course you do! If you didn’t… well… who doesn’t, right? I always believed that people who say the don’t like to read is because they spent their lives reading what [insert here name of school/ adult/ organization] told them to and never ventured out there to find something else. The fact that someone likes a book doesn’t make that book perfect for you. And sometimes we must read the book ourselves to see what we think of it. Have you ever seen how many different opinions you can find if you try to find reviews from books? So how do you feel about copies signed by the author? Pretty cool, huh? I couldn’t care less about autographs from celebrities (sorry guys) but I love books signed by the authors. Okay, so James Mahoney has a deal on his website for signed copies of his books. You can click on the book titles to know more about them. On his website, not here, of course. Life is about the little things that make us happy, right? Sorry about the last post, people. I was feeling down and just had to vent a little. I try to remind myself that things happen when they are supposed to happen, that there’s a reason for everything, and that there’s also a right time for everything, and that it’s not up to us to decide when and how things are going to happen. I believe that if I’m here and if things are the way they are is because that’s how it’s all supposed to be. Not that I think we should all sit back and wait for everything to just magically solve itself, but that there are things we can’t control simply because we can’t really grasp all the future consequences of our choices. We constantly ask ourselves if things would be different had we chosen a different path, and to that I think the answer is yes, things would be. Had I married my high school sweetheart I would be in a completely different place right now. Had I married my ex-fiance I would have never moved here. Had I not decided to move from my hometown to a place where I literally knew no one, things would certainly not be the same. But can I say things would be better? No, I can’t. And to be honest, I believe that I am exactly where I’m supposed to be. No, things didn’t turn out the way I expected them to, but they are a result of the choices I made in life. And for now that’s good enough for me. So moving on, guess what great news I have just received that made me do a little happy dance? I’ll be seeing Jenny Lawson, aka The Bloggess in March! She’ll be on a book tour and will finally come to my town! Not only that, but she’ll be here on a day I can actually go see her. It’s the “now in paperback” book tour of her book (well, what else could it be, right?). In case you’re wondering, yes, I do have her book (hardcover) already, and yes, I will be getting a new one (paperback). Why? Because there’s a new chapter in the paperback and I just have to see it. That’s why. Anyway, I’m really excited! It will be a great way to celebrate my birthday.